Heavy-duty, dual-spring trap that ensures maximum catching power. This “hands-free” mole trap is fast and easy to set. Simply place the trap jaws in an active tunnel and step on the trap’s yellow foot pedal to set the trigger below the surface. When a mole encounters the trigger, the yellow pedal springs up for easy notification. 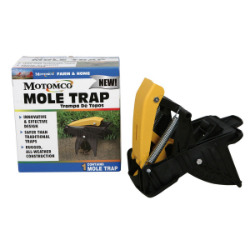 With its safety release button, MOLE TRAP can be disengaged and relocated to other tunnels for use over and over again.